NASA chief scientist Ellen Stofan '83 at NASA Goddard's Visitor Center in Greenbelt, MD. There are no nights on this planet. The sun never goes down. It hangs in the sky, churning out a powerful, possibly dangerous magnetic light show, every day, all year. The year is 35 days long. This planet is tidally locked in orbit with its star, somewhere in the constellation Lyra. One hemisphere receives all of the sun’s heat and light, and the other is always cold and dark. At least, we think so. And then there’s the chance that changes in atmospheric pressure could create a runaway feedback loop that renders the whole place uninhabitable. But if humans ever need to escape our changing, complex planet, it’s still the most Earth-like destination we’ve found so far. It’s just a shame it might take two million years to get there. The planet in question is known as Kepler 438b, an exoplanet huddled close to its red dwarf star, about 470 light years away. In January, NASA announced it as one of the newest exoplanets discovered by its Kepler Space Observatory. If 1.0 is the best score on the Earth Similarity Index (e.g. Earth itself), 438b rates at 0.88. Even if the forbidding hypothetical description above holds true, right now, it’s the best we’ve got. That’s the bad news. The good news, according to NASA Chief Scientist Ellen Stofan ’83, is that we’re just getting started. 438b is only one of 4,000 exoplanets identified so far. “Kepler is looking at a really tiny portion of the night sky,” says Stofan, “so those 4,000 planets are coming from an area you could basically put your thumb over and cover up. Stofan is a planetary geologist who took her William & Mary geology degree to Brown University for a master’s and a doctorate and then to Pasadena, Calif., for more than a decade at the Jet Propulsion Laboratory (JPL). There, Stofan worked on the Magellan spacecraft’s mission to Venus and a number of other projects as chief scientist for the NASA New Millennium Program. After JPL, she joined Proxemy Research in Maryland, where she worked on the Cassini-Huygens mission to Saturn and led its radar mapping of the surface of Titan. Cassini-Huygens found cryovolcanoes and lakes fed by aquifers full of methane on Titan, a place that “stole [her] heart” during the project. She was appointed chief scientist at NASA in 2013, where she leads the science arm of the agency, advises NASA’s administrator and corresponds with other federal organizations. She’s been enjoying the ride ever since. Stofan’s father worked at the Lewis Research Center in Ohio when she was a child, working to minimize “fuel slosh” that might throw a rocket off-balance. There’s a picture of him from 1960 that sits in her office today. ALL ABOARD: NASA astronauts step into the Orion crew module hatch during a series of spacesuit tests conducted in 2013. The module will serve as both transport and a home for astronauts during future long-duration missions. It’s clear that Stofan gets most excited when Mars comes up. The worst-case scenario for Kepler 438b — the one where a small pressure change triggers a climate-destroying catastrophe — is what some think already happened on the Red Planet. But that doesn’t rule out the idea that Mars once was home to life; it does have polar ice caps, after all. At a panel discussion at NASA in April, Stofan gave her own thoughts on the topic. Specifically, field geologists who are today in grade school. NASA’s plans to get humans to Mars are already underway, even if those humans are currently still learning how to tie their shoes. By 2025, the agency will have captured an asteroid into orbit with the Moon and sent humans to study it. In the 2030s, a rocket will propel humans to the surface of Mars. Both of these missions will make use of a vehicle NASA is calling Orion. 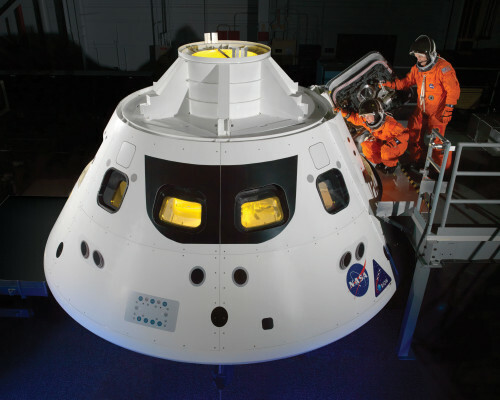 Orion is a capsule reminiscent of the Apollo command module, with room for four astronauts instead of the familiar three. It is capable of 21 days of active flight and six months in inactive mode, during which the astronauts will live in a connected habitat module. In December 2014, the first unmanned launch test of Orion sent the pod 3,000 miles above the Earth’s surface and splashed down off the coast of San Diego. A further series of test launches will prepare NASA and its astronauts for the asteroid mission, and then for the 21-month round trip to Mars. If it all sounds a little farfetched, consider this: last fiscal year, Congress authorized $150 million more for Orion than NASA had requested. Although NASA budgets still aren’t what they were in the Space Race heyday, Stofan looks on the bright side. The most immediate step for human exploration, says Stofan, is a return to launching astronauts from U.S. soil. By working with private companies like Boeing and SpaceX, NASA hopes to end American reliance on the Russian Soyuz program to ferry astronauts to and from the International Space Station (ISS). Crews will continue their pioneering work on the station until at least 2024. The work done on the ISS is instrumental in determining the effects that extended spaceflight has on the human body — critical for the Orion missions to come. “Once the country sees [American manned launches] happening again, once they realize all the amazing research that we’re doing on the International Space Station and sending humans beyond low Earth orbit … I think we’re going to continue to see the bipartisan support,” she says. But NASA is not just going to sit around until Orion launches in the 2020s. Stofan’s scientists are working as hard as they can right now, only remotely. And it’s not your typical telecommute. What you see is not always what you get when it comes to planetary geology. In 1877, Giovanni Schiaparelli discovered what he thought were canals on the surface of Mars — probably built by some alien intelligence. By the time Viking 1 made the first landing on Mars in 1976, it was clear that the planet was cold and arid. The canals were optical illusions, shadows alongside mountain ridges. Viking 1, in turn, uncovered an apparent “Face” on Mars, which was debunked by better cameras aboard Mars Global Surveyor in 1998. In July, the Mars Curiosity rover spotted what some called a female figure overlooking the vehicle from a distance. Except at that scale, she could only have been a few centimeters tall. So when astronomers first observed Pluto in 1930, they saw a tiny dead rock on the furthest reaches of the solar system. In some ways, they were wrong. It just took the better part of a century — and a probe called New Horizons — to gather the details. 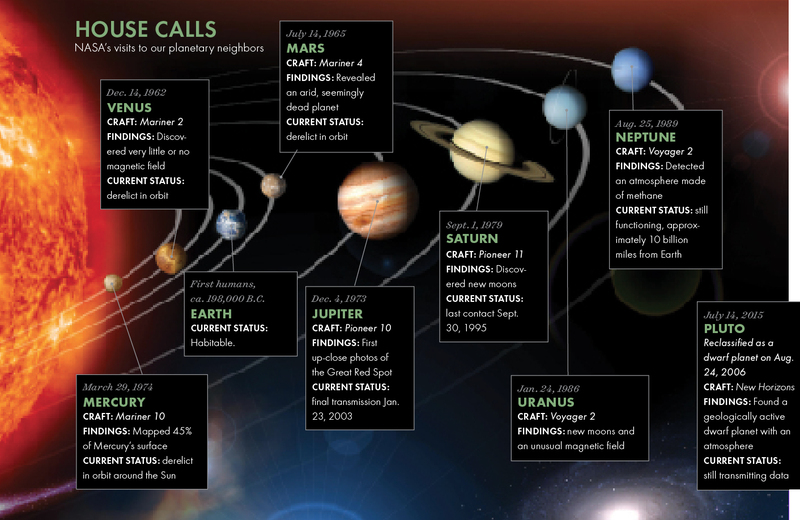 Pluto was the last major body in our solar system to receive a visitor from Earth, completing a mission NASA began in 1962 (see “House Calls”). And while some may question the wisdom of spending $700 million to visit a non-planet, Stofan is confident that by studying our neighbors, there are things to learn about our own planet in the process. NASA expected Pluto to look like Earth’s moon: flat, cratered and geologically dead. Instead, they found mountains that rival some of the Rockies and a planetary core that was active much more recently than previously thought. There may even be ice. For a scientist, being proven wrong can be one of the most fun experiences. And even though Pluto was reclassified as a “dwarf planet” by the International Astronomical Union in 2006, it doesn’t dampen the excitement. NASA is already amidst the Dawn probe’s mission to Ceres, another dwarf planet in the asteroid belt. KEPLER MISSION: Designed to survey a portion of our region of the Milky Way to discover Earth-sized extrasolar planets and estimate how many of the billions of stars in our galaxy have such planets, Kepler’s sole instrument is a photometer that continually monitors the brightness of over 145,000 main sequence stars in a fixed field of view. This data is transmitted to Earth, then analyzed to detect periodic dimming caused by extrasolar planets that cross in front of their host star. To that end, the Kepler mission represents the furthest and most extreme reaches of NASA’s planetary exploration. The Kepler Space Observatory uses the transit method to measure how the light from a distant star changes as a possible exoplanet passes in front of it. The bigger the planet, the larger the effect on the observed brightness. And as the edge of an exoplanet’s atmosphere begins to travel in front of the star, Kepler can detect what sorts of elements are likely to be present in its atmosphere. This helps NASA narrow down the list of more than 4,000 likely exoplanets to only the more Earth-like (see “Second Homes” above). And soon, Kepler is going to get some help. TESS will be looking for exoplanets closer to Earth than Kepler, and in a wider scope — it will take much, much more than a thumbprint to block out its range. NASA expects TESS to spend two years searching more than 500,000 stars for exoplanets of all types. Then, in 2018, the James Webb Space Telescope will launch as a successor to the Hubble. “James Webb will start looking at the atmospheres of those planets around other stars,” says Stofan. “And that’s where it gets really interesting. Any of those gases would be indicative of a potentially life-bearing planet. But Stofan still thinks it will be several decades before we have definitive proof of life on another world. So alongside all this deep space research, she says, NASA is also concerned with the one planet where we know for sure that life is abundant: Earth. NASA is known for the people and probes it sends to other worlds, but there’s plenty that went up into space only to look back at where it came from. Twenty-two NASA satellites orbit Earth today, transmitting data about cloud cover, water temperature and atmospheric composition. “We live on the most beautiful planet in the solar system,” Stofan says, but the data we’re getting back from those satellites isn’t always a pretty picture. 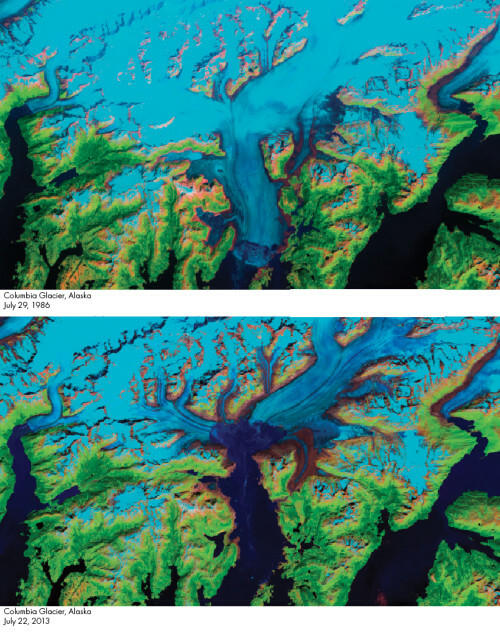 CHANGES: The Columbia Glacier in Alaska is one of many vanishing around the world. Glacier retreat is one of the most direct and understandable effects of climate change. The consquences of the decline in alpine glaciers include contributing to global sea rise. A few months ago, Stofan helped with the release of a massive NASA dataset of rainfall and temperature predictions under several different climate change scenarios. The data projects out to 2099 at a 25-kilometer resolution in hopes of making a real difference for farmers from South America to Iowa as they attempt to plant more resilient crops. “Climate change is alarming,” she says. “You look at these temperatures and you look at these scenarios, and it’s extremely alarming. I don’t want to sugarcoat that. … Climate change isn’t just some abstract thing that might happen in the future. It is happening right now on a day-to-day basis. Stofan wants to use NASA’s data to help mitigate some of the dangers of climate change and try to change our behavior so it doesn’t get worse. But NASA can’t change the world alone. Part of Stofan’s mission is to educate and advocate for the next generation of scientists, who will advance NASA’s mission on Earth and in space. One way to do that is to involve regular folks in a sort of crowd-sourced data-gathering experiment. NASA calls it “citizen science,” and it’s aimed at giving untrained people a role to play in combing through a massive amount of data. 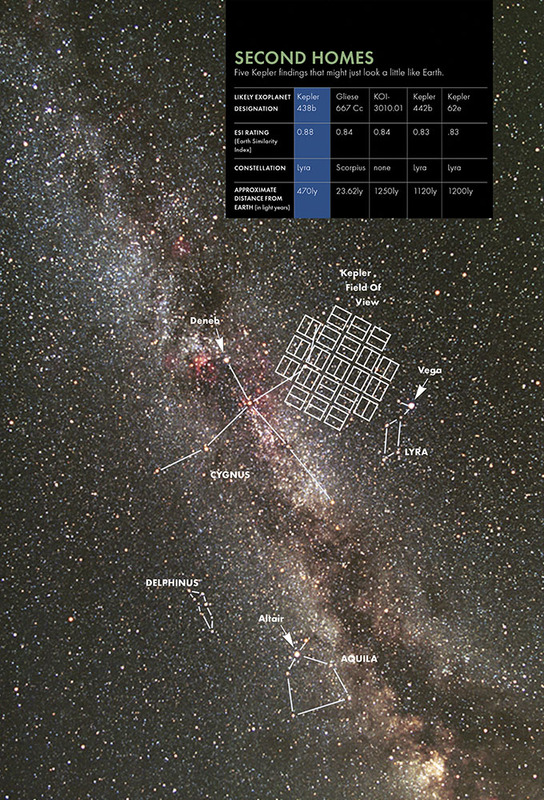 NASA’s Wide-field Infrared Survey Explorer telescope collected thousands of images of stars between 2011 and 2013, and computers weren’t as good as humans at examining them for exoplanet-indicating dust clouds. After posting the images to a public website, NASA received over 1 million classifications of stars by the general public. The No.-1 discoverer got to accompany a NASA scientist to a telescope in Chile to help with further observation. FUTURE ASTRONAUTS: Stofan and NASA Administrator Charles Bolden answer questions from kids prior to the White House’s annual State of Science, Technology, Engineering and Math address in January 2015. Once a month, Stofan takes a trip to an elementary or middle school as outreach to students, which she considers just as important as her other roles at NASA. She’s even been back to William & Mary a number of times to speak with students about planetary geology, but it’s the small children — especially girls — who get most excited. When a little girl draws a female scientist in a white lab coat instead of a man, Stofan gets excited herself. These are the kids, after all, who might be onboard that Orion mission to Mars in the 2030s. Or maybe they’ll study the exoplanetary data returning from the James Webb Space Telescope. Stofan counts herself in the earthbound group, thanks in part to an experience at an early NASA launch. But the thrill of discovery is just as powerful from her office in Washington, D.C. — or on the occasions when data comes back while she’s on vacation. And on a really clear night, from her deck at home in Virginia, she can sometimes watch a rocket launch skyward, soaring into the great unexplored vastness of space. Someday, maybe even to distant, mysterious Kepler 435b.